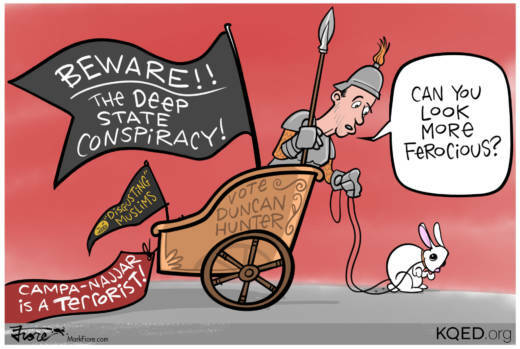 As the race for his House seat tightens, Southern California Republican congressman Duncan Hunter is accusing his opponent of having dangerous terrorist connections. Hunter and his wife were recently indicted for using $250,000 in campaign funds for personal expenses, including flying their pet rabbit on a family vacation. The Republican congressman referred to Muslims as "disgusting" and decried a deep state conspiracy that is out to get him and President Donald Trump. Hunter's opponent, Ammar Campa-Najjar, was born in San Diego County to a Mexican-American mother and Palestinian-American father. It is true that Campa-Najjar's grandfather helped organize the 1972 Munich Olympics terror attack, although the 28-year-old candidate never met his notorious relative.